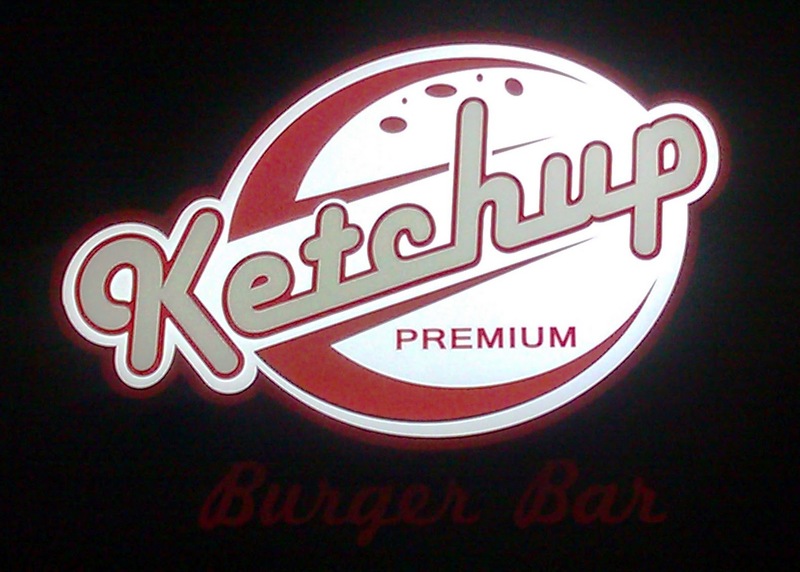 This from the Ketchup site: "....Ketchup Premium Burger Bar was found (sic) by people, just like you, who LOVE burgers. When we opened our doors, we had one goal in mind: Fair prices, fresh ingredients, and fine burgers. We didn’t just want a place where customers could come to grab a quick bite, we wanted a place where customers would be happy to come back time and time again. We decided to only use the freshest ingredients, including our never frozen certified angus beef patties, and our fresh baked buns delivered daily from our local bakery. 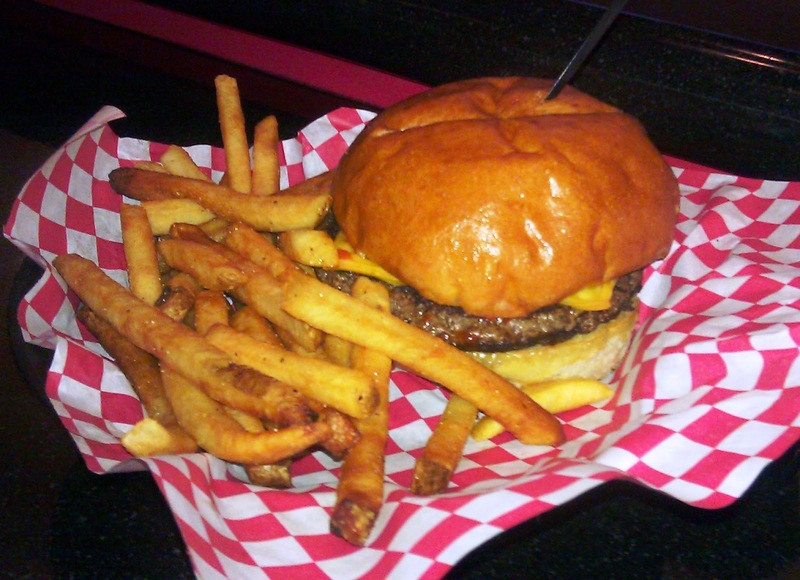 We get it, we’re burger people too, and we hope you like our food just as much as we do..."
The owners of Blondie's Sports Bar, also at Planet Hollywood, had recently opened up a burger joint in the same complex as Gordon Ramsay's outstanding BurGR. This was ballsy, and Happy Meal and I wanted to investigate. We ordered a couple of basic 1/2 pound cheeseburgers ($10) at the counter. Our wait was a scant 4 minutes until our burgers arrived at our table. Now, I love the burger at BurGR.....BUT....sometimes I don't want to wait 45 minutes for a table and then 45 minutes more for a burger at a relatively high cost. The Beef: The 8-ounce beef patty at Ketchup Premium Burger Bar was Certified Angus Beef. I had the familiar beefiness of Chuck, but the GM assured me that it was not. That said the cuts of beef were a mystery. 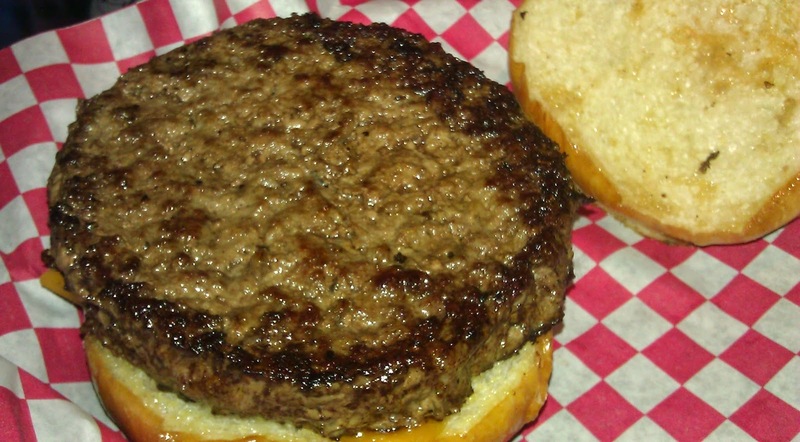 The thick, uniformly round patty was a traditional 80:20 lean to fat ratio. The flavor was all beef. This was a straight-forward burger in terms of flavor. The burger was juicy and not oily. The mouth feel was firm and just chewy enough to outlast the brioche bun. The Sear: The edges of my burger patty picked up a nice sear, but the patty's center contracted as it cooked, so the center lacked a sear. A retooling of the patty or a light griddle weight would have rectified this. The Preparation: The burgers are Ketchup Premium Burger Bar were cooked Medium and FAST on a gas-fired, stainless steel flat-top. The patties were formed with medium pressure. The grind was medium-coarse. The quality of the ingredients was high--the vegetables were especially fresh and ripe. The GM of Ketchup took some time to speak with me, and his focus on quality was clear. 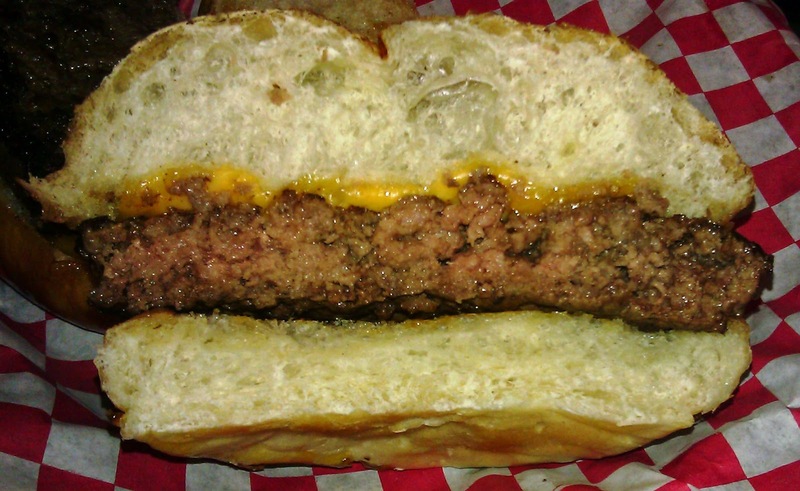 The Cheese: Our cheeseburgers were topped with a thin slice of mild Cheddar. The cheese was a silent passenger. A burger that thick and heavy needed a far bolder cheese to make a noticeable and meaningful contribution. The Bun: The brioche bun was barely toasted, but it was fresh, moist, and buttery. The bite was tender but just firm enough to stand up to the thick beef patty. The Meat To Bun Ratio: This was perfect. The Toppings: There were a variety of ketchups: Balsamic, Sriracha, Hickory, and standard. The Sriracha Ketchup was great. The tomato slices were thick, ripe, and hearty. The Romaine lettuce was perfect. The Fries: These were of the peel-on, par-cooked, frozen, bagged, and delivered in variety, but they were just fine. The fries were perfectly seasoned, well-browned, and crisp. The Value: $10 for a 1/2 pound cheeseburger that arrived with blinding speed was just fine. Happy Meal and I were both happy with our meals. Ketchup Premium Burger Bar was up against an 800-pound culinary gorilla. The price point combined with the speed of service made them a viable alternative for those craving a burger but lacking the foresight to factor in 1.5 hours from asking for a table to sinking teeth into meat, bun, and cheese. Burger Review : High quality ingredients served at a fair price with great haste. The Oreo shake was amazing.